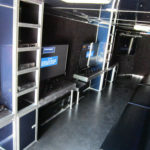 With 7 HUGE TV’s, the best games and consoles, and luxurious stadium seating, our mobile game theatre is the most fun on wheels! This party comes right to you in Edmonton, Sherwood Park, St. Albert and the surrounding Alberta area! We have 5 high-definition screens inside, with two more gaming centers outside. Weather permitting, up to 28 can play at once! Birthday parties, school and non-profit entertainment, fundraising, corporate and promotional events, even tailgate parties! 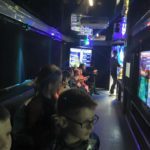 Book your party today!